Based on a June 1965 Community Shelter Plan Study for D.C., we’re visiting former fallout shelter sites to determine how many signs remain and in what condition they are in. 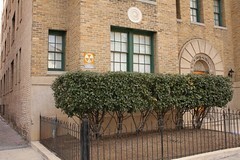 From the relatively few sites we’ve verified, the sign retention rate is very low, with only 5-10% of original fallout shelter signs still posted on buildings. Explore this map to see former fallout shelter locations in your neighborhood and find existing marked sites. Yellow: Extant Sign. Red: Sign lost. Blue: Unverified. Click here for the original list of fallout shelter sites across the city. We’re visiting each site individually to verify if the signs remain. It’s a huge task, so if you’re interested in helping to locate signs in your neighborhood, let us know. 10 Responses to Map of Fallout Shelters in D.C. There was a fallout shelter sign on the side of the Fashion One store at the northeast corner of 7th and H St. NE. I don’t live there any more so I can’t really help. This sign was there at least until 2007 and I can’t imagine it having been removed. Thanks for the tip, Sean! I checked out the street view on the Google map and the sign is in plain sight. We appreciate your interest. 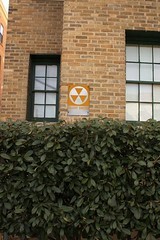 Pingback: Inventory of Park View Area Fallout Shelter Signs « Park View, D.C.
very cool! What do the colors mean? Thanks for the tip! We marked it on the map. There is another sign on the Dept. of Ag. main building, south side (Independence Ave.), underneath the ‘Knapp’ arch (eastern arch). 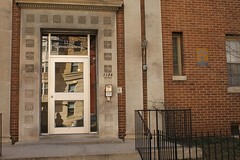 It’s on the right hand side of the doorway, close to the bus stop sign post. I’ll see if I can get a photo to send you- great site! Thanks Tony. I marked it on the map. Great find! these days…. this is one of my fave games to play when im driving round the city ….